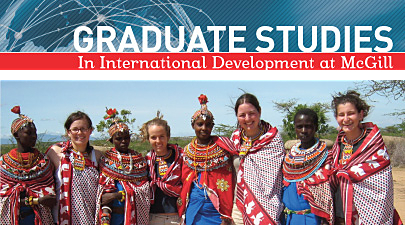 The Institute for the Study of International Development does not offer a master's degree or doctorate in international development studies, but does coordinate the Faculty of Art's Development Studies Option. Full details are available here. General information for potential graduate applicants to McGill University can be found on the Graduate and Postdoctoral Studies website. The Institute for the Study of International Development does not admit graduate students independently and cannot answer your inquiries about admission to McGill. DSO students will complete the regular requirements of their departments for a Masters degree, as well as the additional cross-disciplinary requirements for the DSO. The DSO is a reflection of McGill University’s long-standing tradition of research and education in international development. Within the six participating departments alone, there are approximately 30 professors and 100 graduate students currently working on development issues - undoubtedly one of the largest concentrations of development scholars and students at any university in Canada. Researchers in these units have well-established international reputations and are recognized by their peers as leaders in their fields. The DSO and the Institute for the Study of International Development gratefully acknowledge the support of the Dean of Arts Development Fund for this initiative. For more information on the Development Studies Option, please contact the kirsty.mckinnon [at] mcgill.ca (Institute for the Study of International Development) or the Director of Graduate Studies in any of the participating programs.